The ManageCat is an enterprise-class platform for Apache Tomcat and TomEE, complemented by services and support to enable enterprises to deploy their next microservices applications at scale. Manage, monitor and troubleshoot all of your Apache Tomcat and TomEE servers from a single pane of view. 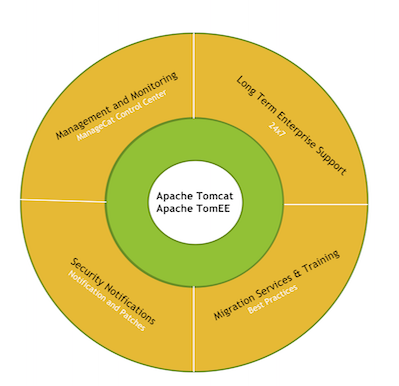 The best enterprise server platform to migrate from other expensive commercial application servers to Apache Tomcat and TomEE. Our open source talented engineers are committed to delivering high-quality 24/7 enterprise support. Our support engineers have years of experience and already worked on problems just like yours. We are the best Apache Tomcat and TomEE support company. ManageCat has everything you need to move from costly Java application servers to Apache Tomcat and Apache TomEE. The ManageCat Enterprise Server Platform is an enterprise-grade server platform based on the open source Apache Tomcat and Apache TomEE application servers, complemented by tool kits for management, monitoring, and troubleshooting; and services and support to enable enterprises to deploy their future Java based microservices applications. Managecat is founded to help our customers to provide enterprise support for Apache Tomcat and Apache TomEE servers with a single management and monitoring platform. Our customers manage thounsands of servers each day with our great engineering support.